(comparative clev·er·er, superlative clever·est) adjective 1. showing intelligence: demonstrating mental agility and creativity It’s a clever idea, but will it work? 2. intelligent: having sharp mental abilities 3. glibly facile: showing highly capable mental abilities in a showy or superficial way Don’t give me one of your clever answers. 4. dexterous: highly skilled in using the hands 5. New England easily managed: describes an animal that is easily managed and controlled 6. New England easygoing but not bright: friendly, easygoing, and affable in manner and personality but not particularly smart 7. Southern U.S. having pleasant disposition: having a pleasant disposition and personality [13th century. Origin ?] 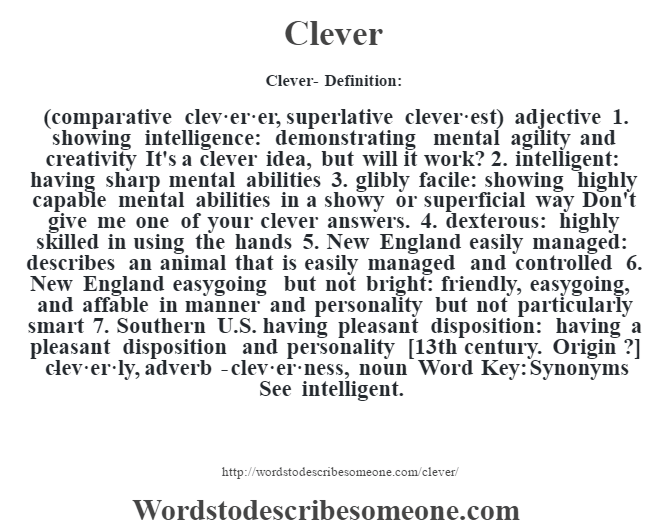 -clev·er·ly, adverb -clev·er·ness, noun Word Key: Synonyms See intelligent.